TROY, NY- As the Tri-City ValleyCats prepare to usher in a new season of affordable family fun and professional baseball to the Capital Region, they will be teaming up once again with BlueShield of Northeastern New York on the Community Grounds Crew and the 3rd Annual '4 in 24' Youth Field Renovation Program. In a 24 hour time period, four chosen youth fields will have new sod placed on their infield while also seeing their pitcher's mound and homeplate areas rebuilt. The simultaneous renovations are scheduled to take place on Friday, April 12. The '4 in 24' is the kick-off event for the Community Grounds Crew, an expanded initiative with the assistance from BlueShield of Northeastern New York. This program will undertake additional projects and renovations on numerous other youth fields throughout the spring and summer. "The ValleyCats are proud to be partnering once again with BlueShield of Northeastern New York to continue the work of our Community Grounds Crew," said ValleyCats Vice President/General Manager Rick Murphy. "With their tremendous support, we are able to provide the youth in our community safe and well-maintained fields on which to play, and as ambassadors for the game of baseball, that is immensely important to us." Following the formation of the Community Grounds Crew last spring, over a dozen youth ball fields have been fully renovated with countless other field projects completed throughout the Capital Region. "BlueShield is excited to support the important field renovations throughout our community again this year," Brian O'Grady, vice president, BlueShield of Northeastern New York, said. "We have seen the impact of tremendously improving the quality of these spaces for children to enjoy one of our country's favorite past times. Our company takes pride in encouraging children to get outside and play with their friends because as we all know- Healthy Changes Everything." The ValleyCats' field renovations have been an annual tradition since 2003 when the first field was officially renovated by the 'Cats in South Troy, just one mile away from Joseph L. Bruno Stadium. Each year since, they have expanded upon its success. In 2011 the 'Cats created the ambitious '4 in 24' project to renovate four youth playing fields in the course of just a 24 hour time period, something totally unique to any field renovation initiative in the country. Each project is also supported by the New York-Penn League Charitable Foundation. Contributions come from past events such as the Capital Region Craft Brewers Festival, hosted by the ValleyCats and Brown's Brewing Company, and the Corporate Cup Tournaments which have included teams from local and regional businesses. 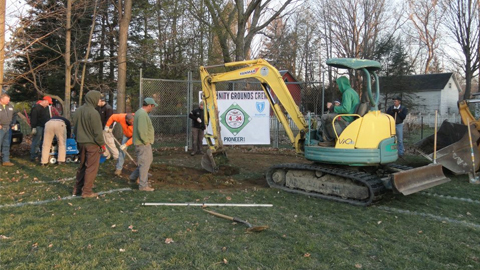 Leagues interested in having their field considered for the '4 in 24' or other Community Grounds Crew renovations must complete an application that can be found on the ValleyCats website, www.tcvalleycats.com. In order to be eligible for the '4 in 24' renovation, applications must be returned by Friday, February 22. Those submitted beyond that date or not selected for the '4 in 24' will remain in consideration for the Community Grounds Crew program, which will accept and evaluate applications on an on-going basis.